In 1909 the first aviation meeting in Doncaster took place - it was a major event for flying pioneers to demonstrate their innovations and show the money men they should be backed. It was a week long event and on the first day the Windham Tractor Monoplane was to be piloted by Captain Walter George Windham. Unfortunately the plane's fuselage broke as Captain Windham sat in it for the first time, during a line up for photos of all the competing aircraft. Captain Windham ended up sitting on the floor, causing much mirth among the assembled. To add to his misfortune, when the plane had been fixed 2 days later, he taxied it right into a car, writing it off. 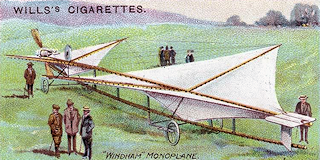 Captain Windham was a founding member of the British Aero Club.